Do you have a Hose Crimper and just need the Hose Ferrules, Brass Hose Barbs, a Fitting Storage Container and a High Quality Hose Cutter. This refill kit for our "Air Hose Repair Kit 3/8" I.D. Hose Only" comes with everything you need to make professional quality 3/8" inside diameter air hose repairs fast and easy. 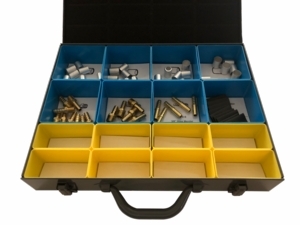 The Kit comes complete with 60 hose ferrules, 35 brass hose barbs, 10 pieces of heat shrink tubing, an option for a hose cutter and an option for a fitting storage container with free bin labels. FRK-38-01, 60 ferrules and 35 hose barbs. FRK-38-02, 60 ferrules and 35 hose barbs and the fitting storage case with free bin labels. FRK-38-03, 60 ferrules and 35 hose barbs, fitting storage case with free bin labels and a hose cutter.